If you are living in the dorms, you have already been signed up for a meal plan through Housing. 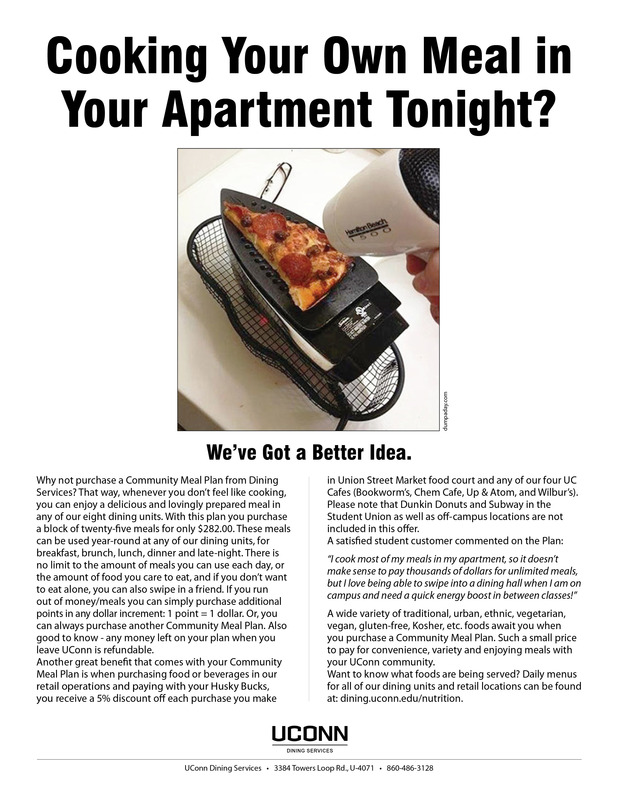 You only need to call Dining Services if you live in the apartments or off-campus. To sign up for your meal plan you will need to call (860-486-3128) or visit the Dining Services main office in Towers, Wade/Hamilton building. Office hours are: Monday - Friday 8:00am - 5:00pm. At this time, we do NOT offer on-line sign up for meal plans. The last day to downgrade your meal plan for the Spring 2019 semester will be Tuesday, February 8th. If you want to upgrade your meal plan you may do so at any time during the semester. Please note that meal plans/prices are based per semester. When dining units are closed for the week of Spring break, meal plans are not active. If you come into the Dining Services main office in Towers (Wade/Hamilton), your meal plan payment will be applied directly to your fee bill. We will no longer accept checks or cash in the main office. Paying online through Bursar's Office: If you choose the option of adding your meal plan purchase to your fee bill at time of sign-up, (this is done at the Dining Services main office) your payment will be due within ten days to the Bursar's office. If not paid within ten days, you will be subject to a $150.00 late fee and/or a hold on your account. You may pay the Bursar's office in person (first floor of the Wilbur Cross building). You may also make free online e-check payments by going to http://www.bursar.uconn.edu/. Credit card payments are accepted online only through the Student Administration System. There is a 2.85% convenience fee for credit card payments. The three meal plan options listed below have been designed for students living on campus. Graduate students, faculty, staff, and commuters may also choose one of the three plans OR they may choose the Community Plan or a Declining Balance Account (the Cash Account). These plans allow for access to all dining units and for those with points, to most retail operations. Husky Bucks may also be purchased. Read on to learn more. Unlimited access during operating hours to resident dining units. No points are attached to this plan allowing the customer to determine what level of points or Husky Bucks they want to purchase. Meal plan points and flex passes Do Not rollover. Unused meals, Flex passes and meal plan points are not reimbursed. Flex passes can be used for guest meals or can be used for value meals at Dining's Grab & Go's. A student who is on the meal plan, due to a class or work conflict, can set up a bag meal account. This can be accomplished by providing validation and completing a request form identifying bag meal dates. Please Note: If you want to upgrade your meal plan, you may do so at any time throughout the semester. If you want to downsize your meal plan, you have until Tuesday, February 8th to do so. Please choose the meal plan which you believe most closely reflects your eating habits and how many meals you will eat during the semester. Please buy conservatively. If you run out of meals toward the end of the semester, you may purchase additional meals through our community plan. Meal options for faculty, staff, commuters and students not living in undergraduate housing, include the three plans listed above which are valid while school is in session. Additionally, we offer the Community Plan, the Community Meal Plan combined with Husky Bucks, and a declining balance account (the cash account) which both stay open year-round. These plans allow for access to all dining units, and for those with points, to most cash operations. These meal plans do roll over from semester to semester but they are not refundable until the person graduates or leaves the UConn community. Students living off campus or in the university apartment complexes can purchase a community plan, which is a block of twenty five meals, for $282.00. This plan is for off campus students, faculty, staff and administration to be used in any of our eight residential Dining Units. This plan stays open year-round. There is no limit to the amount of meals you can use each day and you may bring a guest(s) by simply debiting a meal(s). If you want to pay for this meal plan by payroll deduction, a minimum purchase of 50 meals is required. Cash points can be used at all dining units and most retail operations. All cash point accounts that are inactive for a whole semester will be closed. Requested refunds are issued only if the student is graduating or leaving the University.